In addition to its normal function of a cam follower, each hydraulic valve lifter also serves as an automatic adjuster which maintains zero lash in the valve operating linkage under all operating conditions. By eliminating all lash in the operating linkage and also providing a cushion of oil to absorb operating shocks, the hydraulic valve lifter pro­ motes quiet valve operation. It also eliminates the need for periodic valve adjustment to compensate for wear of parts. A hydraulic valve lifter consists of the following parts assembled as shown in Figure 1. The body is a cam follower which houses all other parts of the lifter. The interior surface of the body and the exterior surface of the plunger are ground to very close limits, then each plunger is selectively fitted to a body to assure free movement with the least possible clearance. The push rod seat is free to move with the plunger in the body and, as its name implies, it provides a spherical seat to support the lower end of the push rod. The plunger spring pushes the plunger and seat upward against the push rod with a ten pound load, which is enough to take up all lash clearances between parts in the valve linkage without affecting positive seating of the valve. The plunger retainer prevents the spring from pushing the parts out of the body when the lifter assembly is not installed in engine. 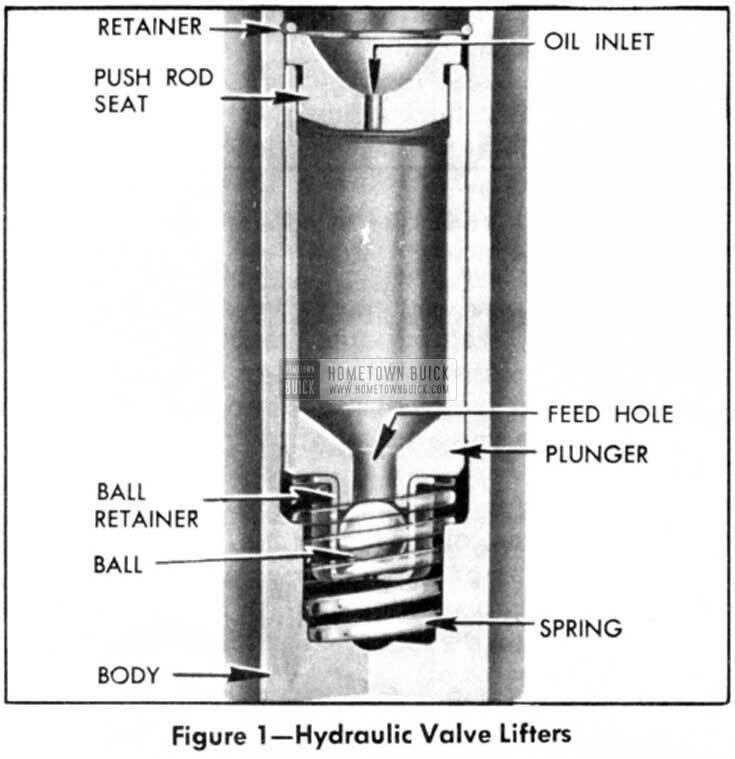 A hole drilled in the push rod seat permits oil to enter the plunger and a feed hole in the plunger permits oil to flow down into the chamber below the plunger. 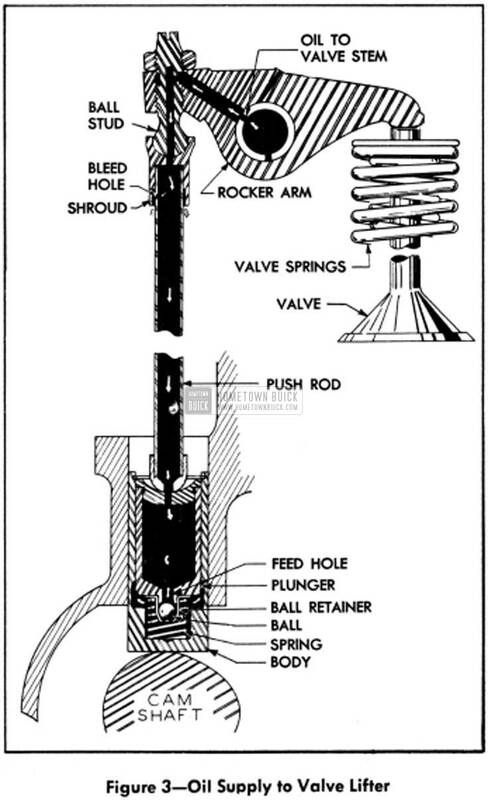 The check ball at lower end of this feed hole controls the flow of oil between the plunger and the lower chamber to compensate for thermal expansion and contraction of valve linkage parts. The check ball is held in place and limited to a travel of .004″ to .008″ by the ball retainer which is pressed against the plunger spring. In operation, the push rod, plunger, and lower chamber of the hydraulic lifter are kept filled with oil supplied by the engine lubrication system. Oil for the valve mechanism is taken from the main oil gallery in the crankcase, passed through the oil filter and conducted to a drilled passage in the cylinder head through external pipes. A short pipe under the rocker arm cover connects the drilled passage to the top of No. 1 rocker arm shaft bracket, through which oil is fed into the hollow rocker arm shaft. The upper pipe fitting in cylinder head has a restricted opening to control the volume of oil supplied to the rocker arm shaft. See Figure 2. A small hole in each rocker arm feeds a slight amount of oil to the contact point between the arm and the valve stem. Another passage conducts oil to the ball stud, where it connects with a groove and oil holes in stud through which oil is fed to the push rod. The push rod ends have holes through which oil is fed into the hollow rod and down into the valve lifter. See Figure 3. The push rod upper end is counterbored to form a shroud around a bleed hole drilled in the push rod tube. The bleed hole permits air and surplus oil to escape from the push rod, thus eliminating air locking and preventing excessive build up of oil pressure which would result in an over-supply of oil to the valve stem. The tubular push rod serves as a reservoir to maintain a head of oil above the valve lifter. See Figure 3. When hydraulic valve lifters are installed in an engine, each lifter is placed on the camshaft base circle (off the cam) and the ball stud is then turned down a prescribed amount. 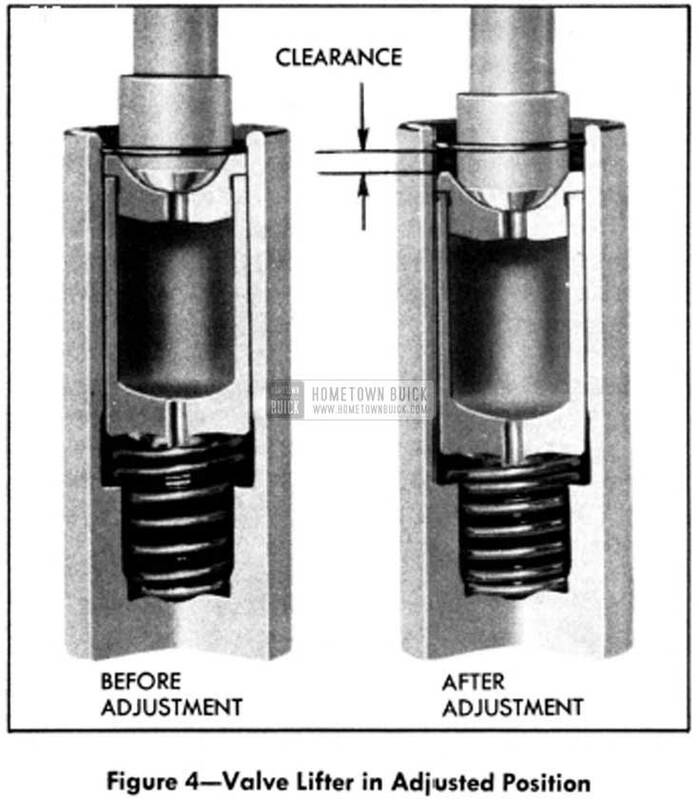 This adjustment pushes the lifter plunger downward away from the plunger retainer so that the plunger cannot contact the retainer during valve operation. The plunger spring then presses the lifter body down against the camshaft and presses the plunger and seat up against the push rod to keep all lash clearance out of the valve linkage. See Figure 4. When the engine is started after installation of the valve lifters, oil is fed to the lifters through the push rod, as previously described. 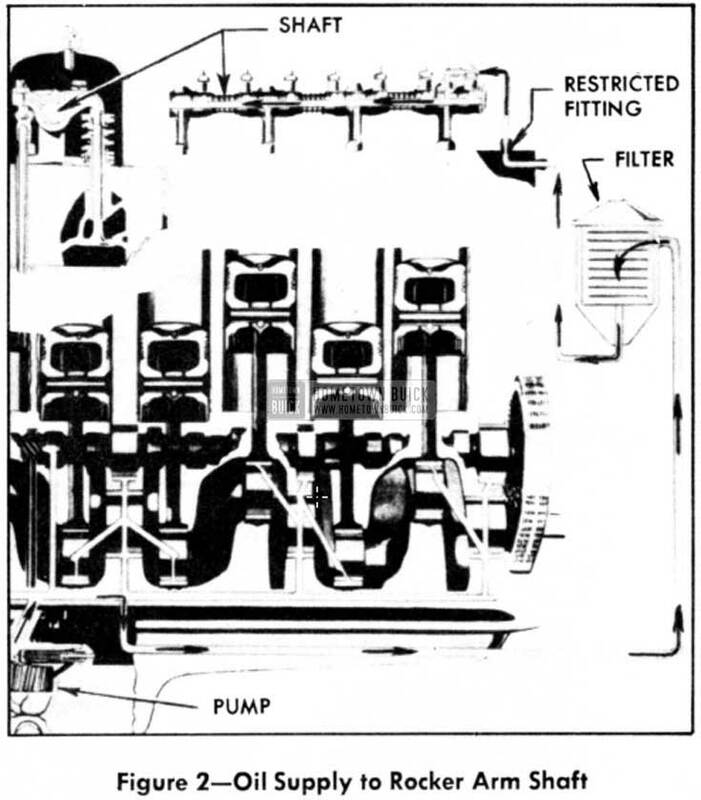 The first few cycles of operation forces out all air and completely fills the plunger and lower chamber of each lifter with oil. As the rotating camshaft starts raising the valve lifter body, oil in the lower chamber begins to flow through the open plunger feed hole but the flow immediately seats the check ball against the plunger to prevent appreciable loss of oil from the lower chamber. The lifting force against the body is then transmitted through the entrapped oil to the check ball and plunger so that the plunger and push rod seat move upward with the body to operate the linkage which opens the engine valve. As the camshaft rotates further to close the engine valve the valve spring forces the linkage and lifter to follow the cam down. When the engine valve seats, the linkage parts and lifter plunger stop but the plunger spring forces the body to follow the cam downward .002″ to .003″ until it again rests on the camshaft base circle. Oil pressure against the check ball ceases when the plunger stops, the check ball drops down against its retainer, and the plunger feed hole is again opened to permit passage of oil between plunger and lower chamber. It should be noted that during each cycle of operation the vertical movement between the body and plunger is only .002 ” to .003″ but the check ball moves through its full travel of .004 ” to .008″. 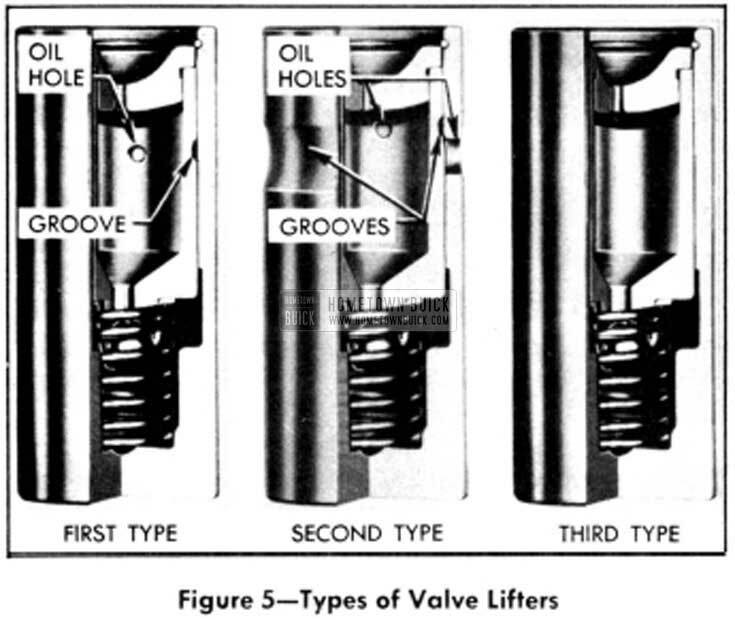 Full opening of the plunger feed hole at the end of each cycle not only permits replacement of oil lost from the lower chamber, as previously described, but also permits control of the volume of oil in lower chamber to compensate for expansion and contraction of the valve linkage parts due to changes in engine temperature. When engine temperature increases and the valve linkage parts expand, the plunger must move to a slightly lower position in the lifter body to assure full closing of the engine valve. When engine temperature decreases and the linkage parts contract, the plunger must move to a slightly higher position in body to prevent lash clearances in the valve linkage. In either case, the capacity of the lower chamber changes and the volume of oil present is automatically controlled by passage of oil through the open plunger feed hole. Three types of hydraulic valve lifters have been used, differing only in regard to the oil grooves and holes in plunger and body. The first type has a groove and hole in the plunger only; the second type has an additional groove and hole in the body; the third type has no grooves or holes in either the plunger or body. See Figure 5. The oil grooves and holes were provided in the earlier type of lifters to insure positive recirculation of oil within the lifters. Experiments have shown that the recirculation was not needed, therefore the grooves and holes were eliminated in the third type. If either a first or a second type valve lifter is found to be in good condition and is performing satisfactorily it should not be replaced simply to install the latest type. 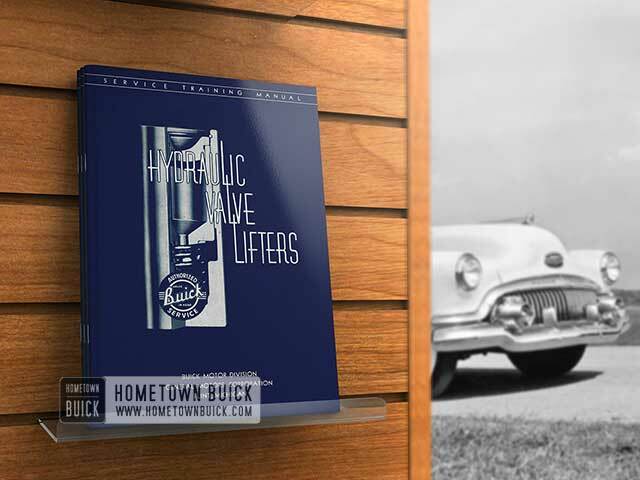 All three types of lifters may be used in the same engine.